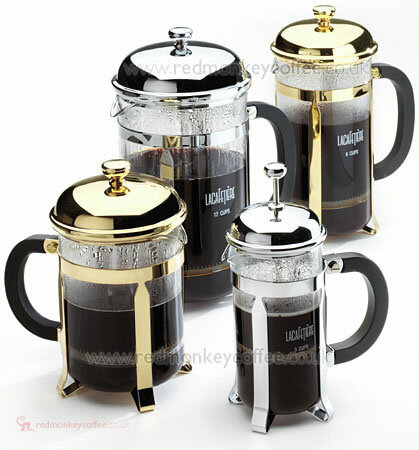 La Cafetieres Classic Cafetiere range UK Gold Plated Cafetiere delivered free in UK Chrome Classic Coffee Press UK. Our range of Original Classic Design Cafetieres in Gold and Chrome available in 3 Cup 4 Cup 8 Cup & 12 Cup. ZOOM + | Click image to view larger photo in a new window. Discontinued By La Cafetiere Sorry. Classic: The original copyrighted French-press cafetiere design. You will be buying the highest quality cafetiere available, a design which has been used for around 30 years. The classic is finished in 24 Carat Gold or Chrome Plated on Stainless Steel. There cafetieres are made by La Cafetiere® who are the copyright owners of the design. The classic is a true classic, quality & sophistication in any setting. For a lower priced alternative click here to view the Optima Range.